2011 Update: This post is old! 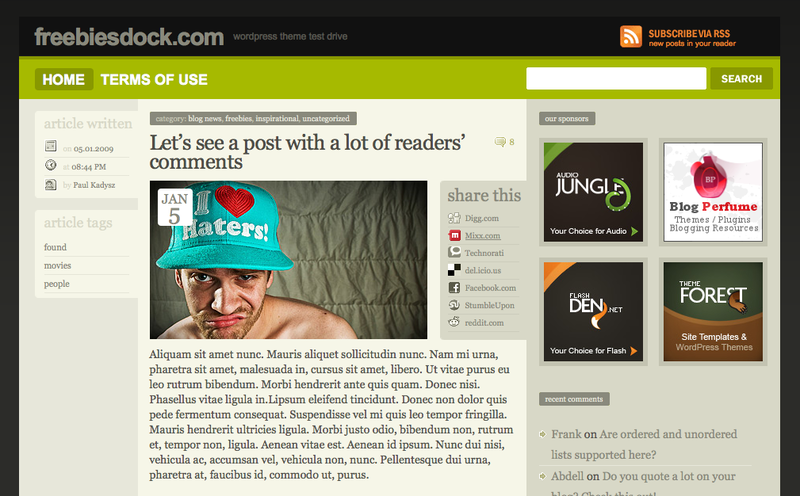 Be sure to read about our new and updated Best WordPress Themes of 2011. It’s a new year, and it’s time for a new list of the best wordpress themes. We all know there is site after site touting theme after theme, and because I didn’t want this to be a “me too” type post where I just copy information from another blog, I have intentionally narrowed down this list to bring you what I think are some of the Best WordPress Themes for 2010. Throughout the year, I will continue to update this list as new themes/marketplaces come on the scene, but for those of you looking for several of the best looking wordpress themes now, I KNOW you will find one or two on this targeted list. Finding nice looking (and usuable) free wordpress themes is a REAL chore these days. Take a look at some of the best free wordpress themes online today with these selections. Remember that with most things that are “free,” you get what you pay for. Finding the needle in the haystack doesn’t have to be impossible anymore thanks to some of these great free themes. 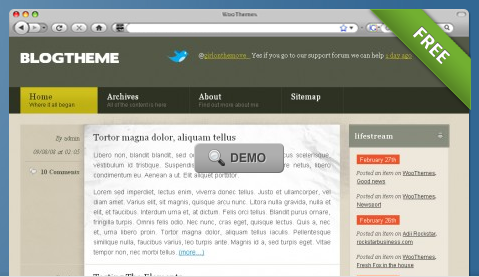 WooThemes is at the top of my list this year. I’ve picked apart several free wordpress themes from several different companies, and from a “complete package” standpoint (out-of-the-box seo, design, and attention to the details), the free wordpress themes from Woo are some of the best I’ve seen. While I’m sure you are no stranger to WooThemes if you’ve spent any amount of time researching WordPress Themes, they continue to be the front of the pack for a reason. Below you will find all of their free themes with links to view and download. 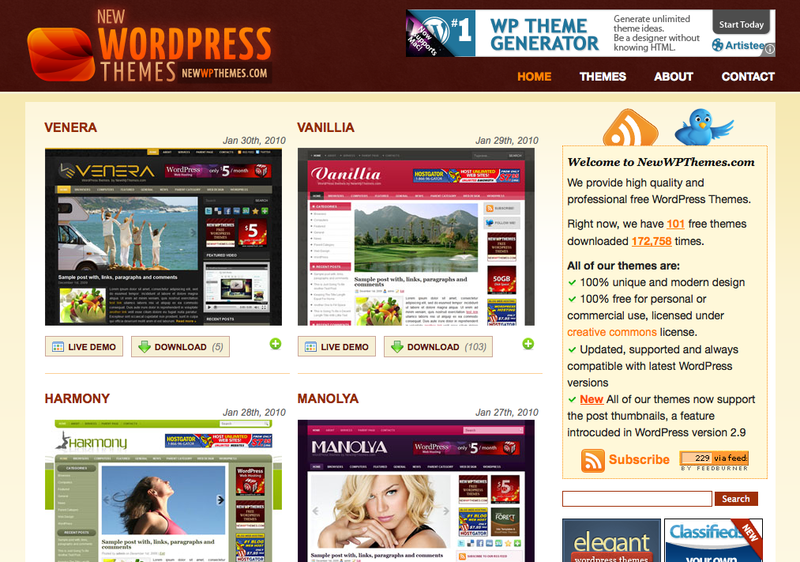 WP Theme Designer has dozens and dozens of high-quality free WordPress Themes. If you are looking for a more artsy, graphically designed, and just all-around uniquely styled WordPress Theme, you will definitely want to check out EZ WP Themes. Not only do they release 5-10 new free themes each month, the look of their designs set them apart from the “typical” theme design. 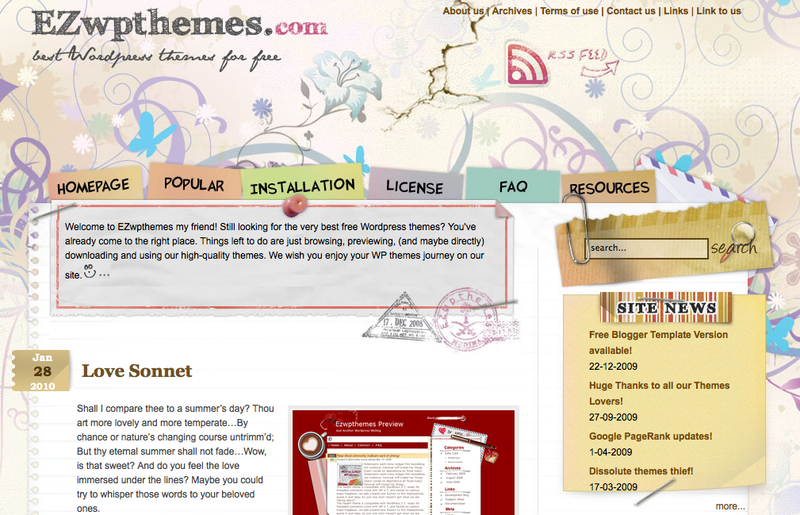 BlogOHBlog continues to be a great place for Free WordPress Themes even in 2010. I have personally hired Jai (the owner) to do some WordPress customization work, and if you are looking for someone who really knows WordPress inside and out, he’s definitely one you should consider (he can be hard to get a hold of sometimes, but he has always done good work). Even if you don’t use him for custom WordPress work, you should at least check out his popular Free WordPress Themes. New WP Themes was “new” to me, but boy was I impressed. Not only do they release a free, new WordPress Theme almost every day, the designs they come up with look pretty professional. Some of the sites that release themes that often lack the “wow” factor because they are just focused on volume. New WP Themes seems to have found a good balance between high volume releases and nice looking designs. WooThemes not only releases some of the Best Free WordPress Themes, they are also one of my favorite places for Premium WordPress Themes. I have bought a lot of themes from Woo, and if you are in the market for a top-notch premium theme, you should definitely check out their offering. It’s one of the best! It was a tough decision between this and my top recommendation, so let me start off by saying this: If you are even thinking about purchasing a premium them, I would sign up for Nick Roach’s Elegant Themes Membership Club. For $39/year you get access to all of his custom designs. They are not only some of the most high quality Premium WordPress Themes of 2010, they come at the absolute cheapest price I have seen anywhere! This is one example where you as the customer get the better end of the bargain. While most individual premium themes cost $40-$100…for a fraction of that, you can download ALL of the premium themes from ElegantThemes. I am personally a member, and I couldn’t be happier. P.S. If you’d like a more in-depth review of Elegant Themes, be sure to check out my detailed Elegant Themes Review. Let me tell you why I ended up picking Theme Forest as the Number 1 destination for Premium WordPress Themes in 2010. About 6 months ago, I stumbled across a site called Audio Jungle where you could buy stock audio and sound clips. I had been looking for a marketplace like this for sometime, and was happy to discover that not only could you purchase stock audio, you could visit one of the many other sites in the Envato Marketplace and purchase things like graphics, pre-coded software and solutions, video, flash, and…you guessed it…Wordpress Themes. 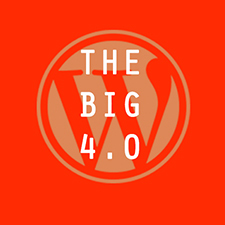 Now the reason this is so powerful is because this is really the only “marketplace” where WordPress developers can come together and release their work to the public, giving us as consumers the chance to sort through hundreds and thousands of different themes. There is no place on the web with a more diverse range of high-quality Premium WordPress Themes at such great prices. FURTHERMORE…when you create your free account at ThemeForest, it can be used at any of the sites on the Envato Marketplace. Now you can not only buy audio, video, code, themes and more, you can do it all in ONE place, with ONE account (you can even sell your own work on the marketplace and earn money). The bottom line: Visit Theme Forest, setup your own account, browse the different marketplaces they have created, and I’m sure you will quickly grow to love the Envato sites as much as I do. They are the first place I turn for all things “web” related, and they are my top pick for Premium WordPress Themes in 2010. Ah, and here I was all excited to get the latest! Guess I’ll have to wait. Sorry for the head fake…it will be live soon! I am really looking forward to your post Kyle or is it Dexter? Choice of themes will depend on a lot of factors such as visual appeal, and SEO factors etc. Can’t wait until they go live. Dexter??? Where did that come from? 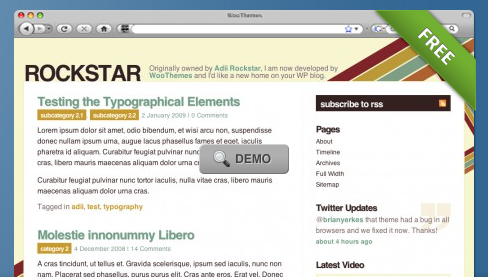 Here it is…The Best WordPress Themes of 2010. I’ll be updating this list throughout the year to make sure it’s kept current. If there are other resources I missed, be sure to post them in the comments. A fairly good list. Although, the last time I checked NewWPThemes.com, and I ran the plugin, TAC ((Theme Authenticity Checker) – http://wordpress.org/extend/plugins/tac/ It showed some suspicious linking happening at the bottom of their themes. Well, thanks google for dropping me to this post. I’ll bookmark it. I really enjoyed checking out this post. I have a mental note in my head of what I think the top themes currently are and it was nice to see some of the ones I thought were awesome listed here. Excellent list. Usually a ‘top free wordpress themes’ post will consist of countless outdated designs that you would not go near with a proverbial. Here you seemed to have genuinely picked out the best. NewWPthemes looks interesting, but all a bit too good to be true? 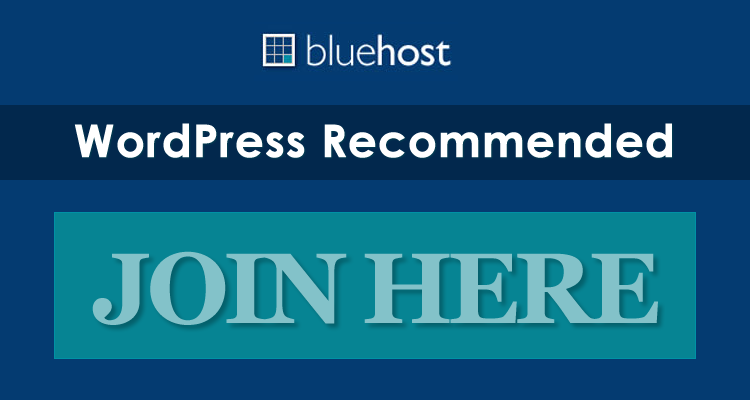 This is an excellent list, we can choose best wordpress theme out of this list, actually all theme are well designed so this is very difficult to choose one theme out of them. I downloaded Premium News Theme from WooThemes I really like this. Thanks a lot. I like most of the templates.. Thumbs up friend.. Very wonderful templates you got there Bro. Thanks to Google I found this wonderful about the best themes. 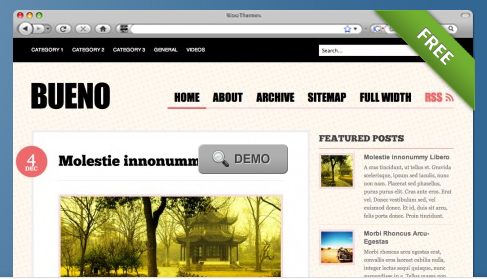 I have used several Woo Themes before and I like the backend a lot. They are SEO friendly and is very user friendly. I’m gonna try the other themes too. Thanks! Very useful post. Nice website for good wordpress themes. I’ve been searching for good quality themes that are for free, good thing i bumped in to your site, these are comparable to premium WP themes and its FREE! Ah nice to see something new! I’ve been looking for themes for my new blog all day and everything is outdated. My current blog uses Bueno by Woo themes and I love it! These are gorgeous designs. Thank you for finding and posting them. Much appreciated. Only problem now is choosing one over the other! I like Simplista, created by WPNow.com. Nice list, but what about Press75.com premium wordpress themes!? They are the best! Great collection here. I must be doing something right because I love Woo and Elegant themes (member of both) and have just started finding some very cool and affordable designs at ThemeForest. Will have to check out wpnow…er..now! PS – There are a couple other theme sites I’ve seen but I can’t remember the names…some cool ecommerce wp themes. Will report back if I can find them. Has anyone tried wpremix? some of these themes are great. I use Woo Themes and Elegant Themes, never heard of Theme Forest. I’m heading on over there now to do some investigating. Thanks for the awesome post. Those templates are gorgeous. great, woothemes and elegantthemes I agree that they rock, some great template too at http://www.filegraphic.com , keep it up..
A really great and useful WP theme list at last! I think I’ve now found my solution thanks to your help. I went for both Theme Forest and Eligant themes, for obvious reasons. I particularly appreciate the good craftspersonship from ET, together with clean design! Thanks again so very much! Personally I think Bigcolors is awesome. The themes are great, but they are a non-for-profit who give the money to the designer’s charity of choice. Excellent cause and awesome looking site/logo! 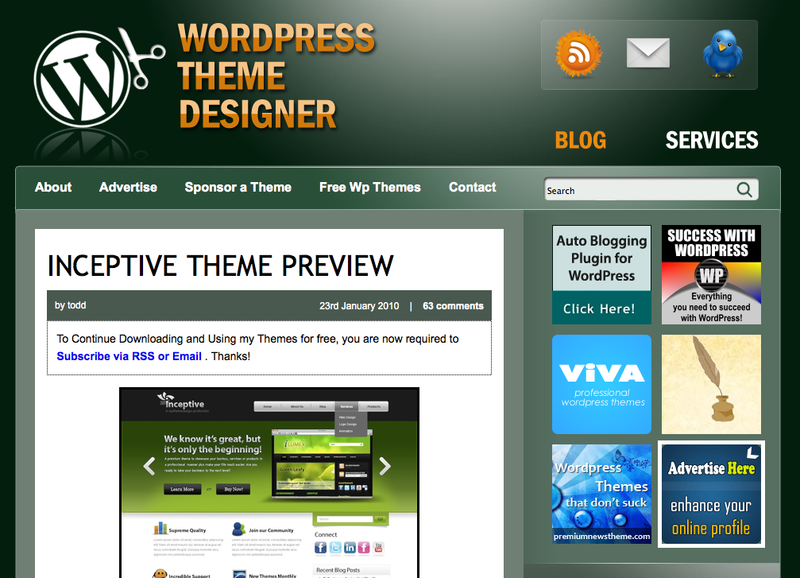 I hadnt heard of New WP Themes and really appreciated getting that link…its a cool site. 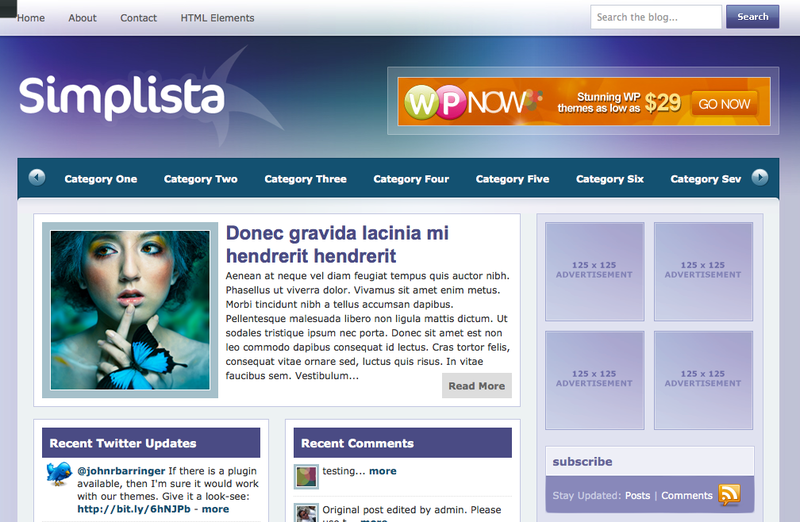 thanks A really great and useful WP theme list at last! I think I’ve now found my solution thanks to your help. I went for both Theme Forest and Eligant themes, for obvious reasons. I particularly appreciate the good craftspersonship from ET, together with clean design! Thanks again so very much! These guys from Woo really make excellent themes! Great Themes! My two favorite marketplaces are ThemeForest for it’s huge selection of themes and ElegantThemes for the amazing deal of only paying $20 and getting access to all of Nick’s beautiful themes. i wish you could include more of themeforest themes that has alot of sales, but all in all i find the themes here great. will get back to look for more in the future. Funny you’d mention that…we were just getting ready to create a Theme Forest section showing some of the top rated themes! Bueno theme looks perfect. Nice share. If you have some bucks to spend, I highly recommend to buy one of the premium themes. They are much more powerful, flexible and have great support to answer your questions. Nice List, cool Stuff. thx for this. i dont know before that i can use WP for Picture Sites. This page would be a haven for all bloggers who wants to get an idea on what kind of templates they will be using for free. The best thing is that it’s just easy as 1-2-3 to install templates in WordPress 3.1 versions. awesome list. This is the best list of free theme i ever seen. waiting for more such awesome lists, may be list of plugins. great templates… thank you very much for your sharing. Here it is…The Best WordPress Themes of 2010.
thanks, nice collection, i would like to know which theme is most seo friendly and supports the threaded comments? Regarding nested comments, I’m not sure which of these support that, but I have a feeling most of the WooThemes (and probably for sure their latest free WordPress themes) support this feature. When is a theme a good theme? Is it because it’s different? Fast? Good looking? SEO-optimized? Of just because you have a personal favour for them? And do you have a RSS? I would like to follow to see the best wordpress themes of next year ;-). Premium News is the best wordpress theme. i am using elegant themes. good job and thanks for the post. Woo themes is the best !!! Excellent composition of themes, you have done a fabulous job. I personally feel, Woo themes are better than others. Kyle, how are the websites on SEO? I did have a Whoohoo theme and the SEO didn’t seam as clean as it should have been. Were you using a SEO plugin like ALL IN ONE SEO with it? And how long ago were you using a Woo theme? I know they have changed quite a bit in the past 12 months in terms of what they are building out of the box (from an SEO perspective) with their themes. I’ve been looking for a new theme for my blog and will try one of the Woo themes, as I’m not hapy with the look nor the seo features for my current theme. Is th All In One SEO Plug in enough do you think if I were to use the Bueno Theme? I’ll put it this way….the All In One SEO Plugin is ALL I use Having said that, I know WOO has updated a lot of their themes to be completely SEO friendly (customizable) out of the box so you may not have a need for the plugin with a WOO WordPress Theme. Thanks a lot for this great list that saves me time. 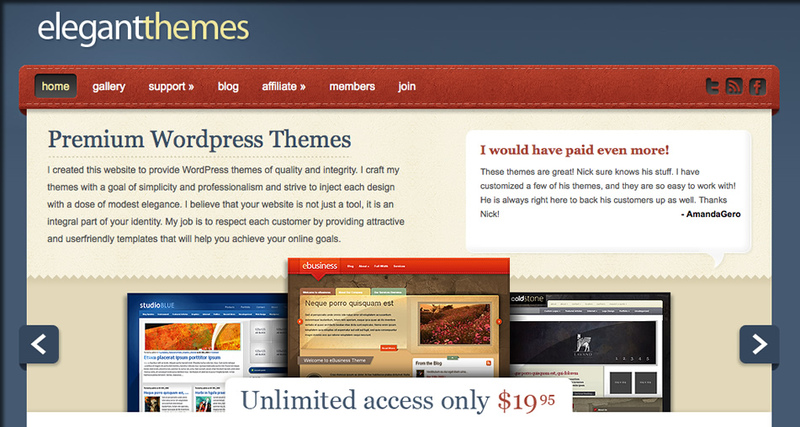 I especially like the Freemium WordPress theme. Blog Oh Blog is the best !!! 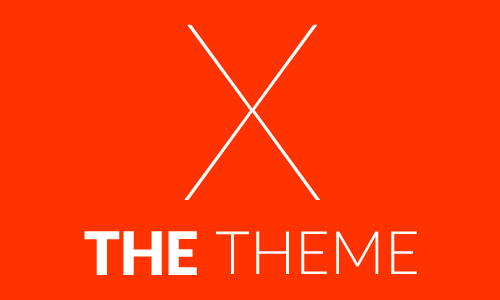 A nice selection of Themes but it would have been nice to have seen more premium themes. 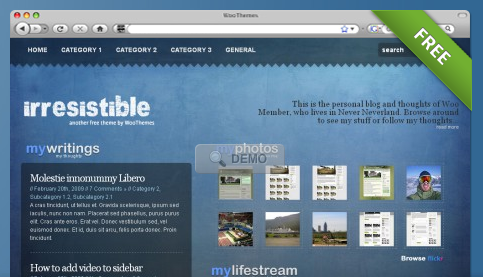 I personally use Thesis and Flexsqueeze on my blogs but of the two Flexsqueeze is by far the best. You’re in luck, Sire. We like premium WordPress themes so much that we are working on a whole section of the site that will be devoted to the best premium WordPress themes on the market today (and it will be updated daily). We plan to launch it January 1, 2011 so check back soon! Thanks Mandar…We are completely updating this list to showcase the Best WordPress Themes of 2011, and we will be releasing it in just a few weeks. Best themes, best blog, thanks! Do you have only included unpaid themes in it? WOW! 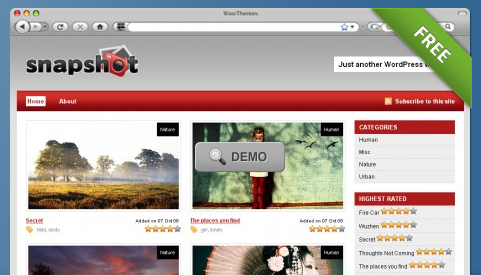 I definitely agree that ENVATO is awesome, we found a few neat WP themes there, both free and premium. 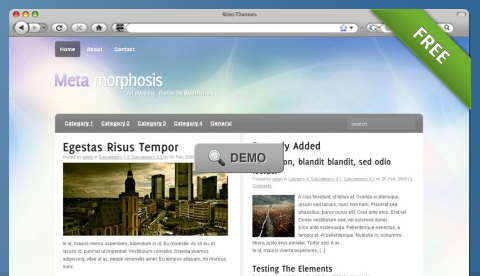 WooThemes is definitely up in the minds of consumers but Elegant Themes is definitely a site we should check out! Thanks for the list! The wait is almost over! 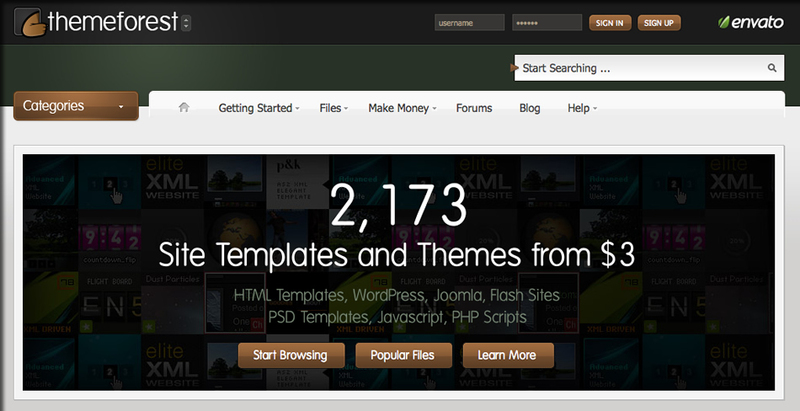 Our list of best WordPress themes for 2011 is in the que to be published at 12:01am on January 1, 2011. I have just downloaded freemium for my virtual assistant business and would like to thank you for sharing these themes. I will report back later with my feedback. These themes are awesome. Nice list. I like to use wordpress to design some of my websites it makes my life easier. 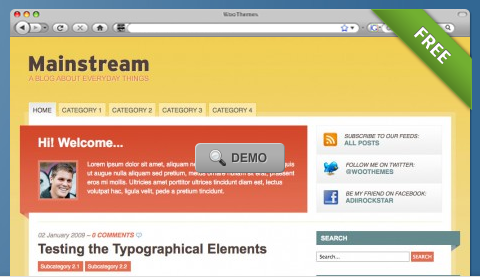 wow, that is the best wordpress themes. really nice post admin. thanks a lot for sharing. I found Woo news the free woo theme.